In the Kalos region there is a forest, far from any town, that is rarely visited by trainers. It is said that in this forest, Pokemon are able to grow even stronger and more powerful because of the isolation that they have, free from any trainers. There are even rumors of legendary Pokemon roaming the area. Of course, this is only said because hardly anyone travels there. The forest is pretty hard to get to and many trainers choose not to believe the stories and say that it isn't worth their time. Or, they just get lost and turn back toward the nearest town. Some say that only certain trainers can even find this forest, but they've never said what kind of trainers. It seems that this forest is shrouded in mystery and rumors. Even though this forest seems impossible to get to, there are certain people who find it. Sometimes, they are determined enough to hike through the mountains and try to find the powerful Pokemon they were promised. Other times, trainers accidentally find it when they are just exploring. There have even been a few cases where young children have ran away from home and somehow made their way to this forest. While there are those few that have made it there, there are countless more that have tried and failed. However, there is one trainer that has made her home in that area. If asked about the mysterious forest, she would simply say that those that were meant to find it do. The ones that shouldn't be there rarely ever make it there. If they do happen to find this forest, then they are quickly driven away. 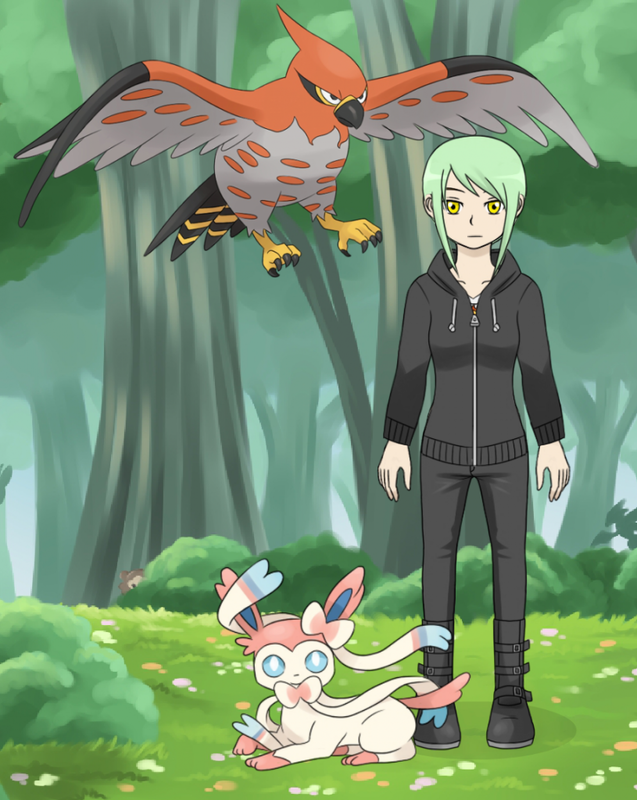 This trainer lives in the forest, helping the Pokemon and protecting them from any unwanted visitors. 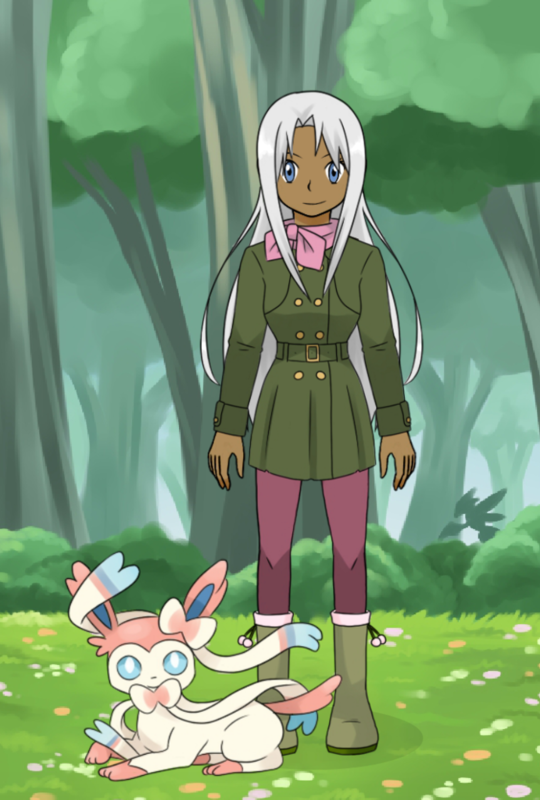 Mostly, she just trains her team of Pokemon and explores the vast forest to see the different Pokemon that hide in it. Every once in a while, though, she will find that another trainer has made their way to the forest. Usually, she stays out of sight until they leave. Sometimes, she may talk to the trainer if they seem lost or like they need help. If the trainer doesn't seem friendly, then she may intervene to chase them off. That doesn't happen often, though. I don't have too much of a plan for this one when it comes to a story (I do have a few ideas), so to start out with, this is just going to be character interactions and we'll take it from there. For this roleplay, I am going to have only one main character, but I will be controlling the Pokemon in the forest. This means that if your character happens to wander into the forest, I might have a wild Pokemon attack. Any wild Pokemon can be captured and once they are captured, then you can be the one to control them. If you want me to continue to control the Pokemon that you captured, then I have no problem with that either. Also, if you want me to roleplay as any Pokemon already in your possession, then I will gladly do that too. Basically, I can be any Pokemon, just message me and ask. It should also be noted that the Pokemon in this forest aren't just limited to the Kalos region. There are Pokemon from every region here. Just another thing that is special about this forest. If you want to play as a younger trainer (or even a kid that isn't a trainer yet) then that's fine, my character will probably gladly supply any new trainers with a Pokemon (of your choosing, of course). Message me with any questions because it wouldn't surprise me if none of that made sense! -Only 6 Pokemon per trainer (less or none is fine). -If you join, you need to be able to put a good amount into your post. Not just a couple lines. -Good grammar and punctuation is important. -I probably forgot a few things, so again, just message me with questions. I'm sure I left something out. This was typed out late at night, so I'm sorry if it doesn't make complete sense. Backstory: She lived in a lab in a different part of the Kalos region. Her mom is a doctor of both Pokemon and people. Her father is a Pokemon researcher. Both of them are pretty well known for their work and this is also how Storm got her first Pokemon (Noibat). She discovered the forest when she was travelling and has lived there for a few years, leaving every once in a while for supplies and to visit old friends. History: Not much of anything important happened to her in her life. She came to the Kalos region on her own when she was 14 from the Hoenn region in order to study the different kinds of pokemon despite her not having any of her own. The only reason she was able to do it was because of Professor Sycamore, who she happened to quite literally run into when he was visiting the Hoenn region. They got on the topic of pokemon and she mentioned how she wanted to go to Kalos but wasn't able to because of her mom and dad not wanting her to go on her own and not being able to afford it. Professor Sycamore offered to take her under his personal care, which her mother and father agreed on, and she was sent off to Kalos on the return trip with the professor. He gave her her choice of one of the six starter pokemon he had and she chose Charmander. Over the next two and a half years she studied regular pokemon extensively and trained her Charmander, as well as the three other pokemon she acquired, before turning to the legendaries. As soon as she heard of Yveltal, she became entranced with them and her ultimate goal became to find where Yveltal was, as no one had seen the pokemon in hundreds of years. After half a year of research, she turned up a clue about how they were in a forest known only as the Forest of Mysteries. Although that was enough to make her want to go, she also learned of the rumours of mysterious powers there that caused the pokemon to be stronger. With Sycamore's approval, although she didn't really need it as she had been doing her own thing for quite some time while under his care, she left for the forest with her pokemon. History: Currently resides in the Forest of Mystery in secret. He doesn't remember much of his past, but he managed to stumble into the forest one night, barely alive and crying. He made it a long way into the forest when a Hydreigon attacked him. Although he tried to escape, he was too weak and collapsed onto the forest floor. Just when the Hydreigon was about to kill him, a wild Zoroark attacked the Hydreigon, fighting it off and returning to him. By that time he had fallen unconscious, but the pokemon cared for him, staying with him and feeding him until he had enough strength to move on his own. Then she just continued to stay with him. It was a particularly nice day in the Forest of Mystery. For the past few weeks it had been raining nonstop, but it seemed like the bad weather was gone, at least for a while. For now, not a cloud was in the sky and the wind was hardly blowing. The light breeze that was in the forest was just enough to rustle the leaves of the tall trees. Throughout the forest, there were small streams snaking their way between the trees. The main source of water, though, was a large lake in the middle of the trees. The forest was surrounded by tall mountains, which looked like they would take days to explore, if not more. Some parts of the mountains were also covered in trees, but most were bare and rocky, most likely with caves scattered throughout them. Like on most sunny days in the forest, the Pokemon were very active, maybe even more so because of the prolonged bad weather. Deep in the forest, at the base of one of the taller mountains, a few Pokemon were quite active. Along with their trainer, they were actually causing quite a bit of noise. 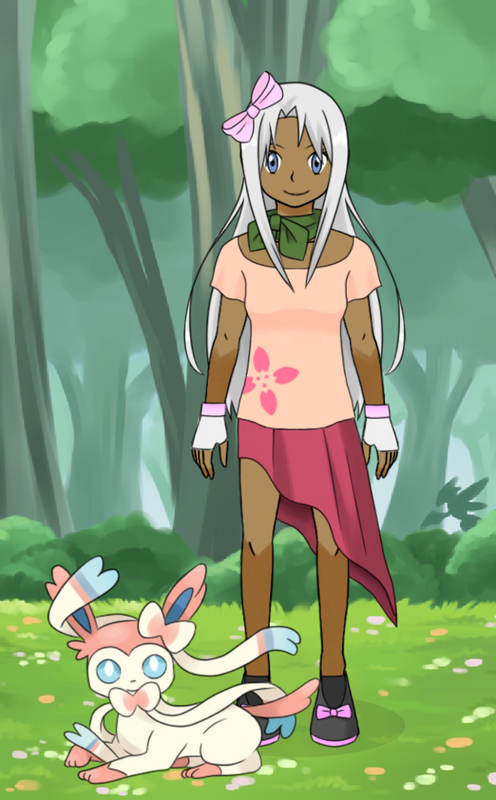 At the base of the mountain, a young female trainer, Storm, stood with a Noibat flying around her. She was looking up at the side of the mountain, watching another Pokemon and yelling out encouragement every once in a while. The Pokemon she was watching appeared to be a Blaziken. It looked like the Pokemon was jumping up from ledge to ledge, moving with great speed. "Great job Blaziken! Keep up the speed!" As she was watching the Blaziken, which was now leaping back down, an Ampharos stood not to far off, sparks leaping as it waited patiently. Storm glanced at the Ampharos just as Blaziken landed on the ground in front of her. "Alright you two. Ready?" Both nodded in unison crouched down in preparation. "And.... Go Blaziken!" The Blaziken immediately leaped straight up, repeating what he had done last time and jumping his way up the ledge. Storm watched as she started speaking to Ampharos. "Hang on... One more jump. Now! Use thunderbolt!" With that, Ampharos let off a powerful surge of electricity, which traveled up and hit the side of the mountain, high above Blaziken. Once the attack made contact with the mountain, rocks broke off and started falling toward Blaziken. However, the fire Pokemon continued leaping up toward them. "Alright Blaziken, get to the top where Noibat put the flag! Dodge the boulders!" Even though Storm couldn't see it, Blaziken gave a nod and continued to jump, easily dodging the smaller rocks that fell. Soon, though, he was faced with much larger ones. For a moment, he seemed to hesitate. "Don't hesitate! If you slow down, you might fall. Just know where the rocks will be and where you need to be to avoid them." Blaziken gave another nod and continued forward, dodging the larger ones that continued to fall. "Okay Ampharos, use thunderbolt one more time." After Ampharos did, a much larger rock began falling toward Blaziken. "Blaziken, use flamethrower to slow it down!" Blaziken took in a deep breath and crouched down, launching himself straight up at the same time he let out a powerful flamethrower. He only stopped once he landed on the next ledge. "Alright, now finish it with fire punch!" Fire then surrounded Blaziken's fist as he pushed himself forward again. He pulled his arm back and, just before he collided with the boulder, threw his arm forward. The force of the punch on the already heated rock was enough to make it break apart with a loud Crack and Blaziken landed on a wider ledge where a red flag was waving. He grabbed it and waved it proudly in the air. "Great job!" Storm cheered as he began to make his way back down. By that time, a few Pokemon had come out of the forest to see what was happening. The large display of electricity hitting the mountain and a rock being broken apart wasn't exactly discreet. Of course, most of the Pokemon new about this trainer and her team living in the forest. It had been this way for a few years now. He didn't know how long he had been asleep, but once Jamie popped out of the mound of fur that was curled around him, he could instantly see that the rain had finally stopped. He grinned and stood, crouching down next to the grey and red pokemon that had taken care of him for a while now. In fact, he hadn't gotten wet hardly at all this last week or two from the rain except in the very beginning because when it started she had carried him to a cave she had found. Although he couldn't speak her language, over the years he had learned to interpret what she was at least trying to say. And so, when the pokemon had brought him to the cave, it only took him a few seconds to decipher that she wanted him to stay here while she went out and foraged food for them. It had been that way ever since it had started raining, and he hadn't left the cave since the first day. It was pretty boring at first, not being able to go out and see more of the forest, which seemed to grow bigger everyday he went into it. There was always some crevice, some rock formation that he hadn't seen before. But, a couple days in, some stray pokemon would wander in seeking shelter from the rain and stay for a while before heading out. Lightly, Jamie pushed on the pokemon's furry arm. "Zoroark, come on! The rain stopped!" The creature's bright blue eyes opened and looked at the boy before shifting to outside before giving a noise like a sigh and getting to her feet. She poked her head out of the cave, checking before giving a nod to Jamie. With a grin, the boy scrambled out of the cave ahead of the Zoroark and took off, leaving the pokemon to let out a cry of protest. Jamie didn't know where he was going at first. He just wanted to stretch his legs after not being able to in a while. However, it wasn't long before he heard an earth shattering boom not that far away and adjusted his course to check it out. He did, however, slow down. There was another trainer in this forest, he knew. She had been here for longer than Jamie had, but how much longer he didn't know. He had never spoken to her. She didn't even know he existed much less live in the same forest as she did. He saw her often though. And since he didn't know her name, he simply called her Trainer when he was talking about her to Zoroark. 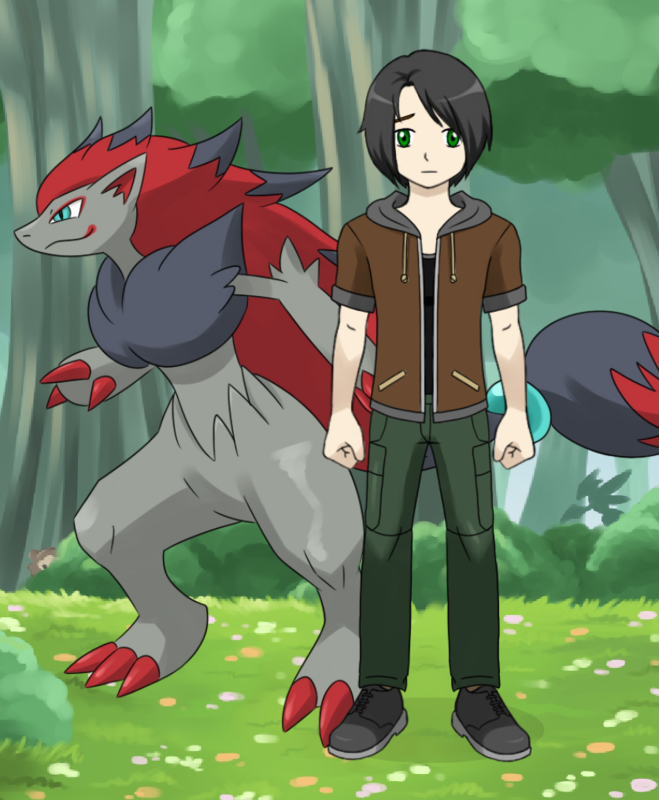 It only took minutes before Jamie was at the edge of the forest and he peeked out, Zoroark practically materialising behind him in case they needed to make a quick getaway. What he saw was no surprise. Trainer was out with her pokemon, doing some of her usual things. He didn't know exactly what had gone on, but judging from the rock debris and her Blaziken climbing down the side of the mountain, he guessed it was some sort of training. The wind whistled in Sen's ears, blowing her short hair back as she hunched on the back of the Talonflame, trying to read her map but not wanting to get blown off at the same time. Beneath her, the Talonflame cawed out in annoyance, battling at staying still in the strong winds. "What? Of course I'm not lost. I know exactly where we're going." She grumbled, before tucking the map into pokebelt pocket. The Talonflame gave a short whistle this time, raising one of it's wings quickly to hit Sen's leg before resuming its original position. "Oh come on, Slayer. Don't you trust me?" As she said it, she straightened up to scan the land for any hints of where she was going. There wasn't a reply for a while and Sen had just looked down to see what was the matter only to find Slayer glaring up at her with a bright yellow eye. "Hey don't give me that look, grumpy. We're almost there, I can sense it." She leaned down against the neck of the bird, grabbing onto the soft leather collar used for flying and the Talonflame took off like a shot, corkscrewing down out of the winds and straightening out below. With the speed that they were flying, it was only a few minutes before Sen pulled on the collar, indicating for Slayer to slow down but keep flying forwards. "I think it's down there!" They were over an incredibly large forest with huge mountains surrounding each side. What was peculiar is that Sen didn't even see the mountains come up. Turning her head while flying, Sen looked behind her, only to see a mountain that looked even bigger than the others blocking the path through the sky that they had just entered from. Where had that come from? "Hey Slayer, let's land. I'm pretty sure this is it." Slayer let out a caw before tipping down and folding in his wings a little and they sliced through the air until he pulled up and set them both gently on the ground. The Talonflame let out a little caw, looking at the bag, but Sen shook her head. "I want you to stay out here for a little while, buddy. I don't know what we're getting into." As compensation, Sen opened up the pokebelt and tossed the Talonflame a Watmel berry, one of his favourites before they continued on through the fabled forest together. Storm waited as Blaziken made his way down the mountain. As soon as his feet touched down in the grass, she ran over to him and hugged him before taking the red flag he was holding. "That was great Blaziken!" Blaziken let out a happy, "Blaaaze" As Storm stepped back and looked at the side of the mountain. "Well, I guess we've done enough damage for one day. As she looked at the mountain, Noibat flew around Blaziken, dodging as Blaziken tried to grab Noibat out of the air while Ampharos stood and watched. Storm glanced over her shoulder and laughed at the display. "Well, if you guys want to play that game, why didn't you just say so?" They all stopped and looked at Storm as she held up the red flag. Noibat flew over and landed on her head. Storm picked up Noibat from her head and tied the flag around one of his feet, tossing him up into the air once she was done. He hovered in the air above them as Storm spoke. "Alright, first one to retrieve the flag and take it to the top of the hill wins. You can use attacks and don't forget, I'll be playing too. Everyone ready?" Storm lined up with Blaziken and Ampharos as Noibat flew above them. Just as Storm was about to say 'go' she heard a commotion from the treeline behind them. Frogadier crouched on a branch high in the trees, using the shadows to hide. He was looking down at a strange sight, a boy and a Pokemon watching his trainer. He dropped down to the lower branches, silent as ever and landing lightly enough to not disturb a leaf. As he watched them, he let out a low "Fro", which was the only warning as he put his hands together. A glowing blue orb formed as he built up power for a water pulse attack. He pushed the attack toward the boy and the Pokemon, though he aimed it toward a tree beside them instead of directly at them. After the attack hit, he dropped down behind them and started building up another water pulse. At the same time he started again, Storm ran up from the clearing and into the treeline. The first thing she saw was Frogadier getting ready to attack. Then she saw what he was attacking. "Frogadier, wait!" As soon as she said this, Frogadier put his hands down and the blue orb disappeared. Storm looked at the boy and the Pokemon, smiling in a friendly way. "Hi! Sorry about Frogadier, he's a little protective..." Storm looked pointedly at Frogadier as she said this, but he simply crossed his arms and looked away, muttering, "Gadier..."
She then looked at the boy again. "My name is Storm. What's yours?" The forest around Sen seemed alive with Pokemon. Without any trainers around, the Pokemon were free to roam and do as they pleased without worrying about being captured. Many different types were flying overhead or scurrying around on the forest floor. The path that she walked on seemed to be pretty well used, though the tracks on it were purely Pokemon tracks. Tall trees grew on either side of the path, but up ahead it looked like they thinned out before stopping. Maybe there was a lake? As she walked, Pokemon sometimes ran across the path. At one point, two Ratata ran into the path, one chasing the other. The first one stopped upon seeing the stranger, causing the second one to crash into it. Both toppled over and then stared at the new trainer a few seconds before darting into the undergrowth on the other side of the path. It was clear they weren't used to seeing trainers. After a little while longer, a sudden bolt of lightning struck the ground in front of Sen. The attack was followed by a Raichu jumping out from the bushes in front of them. It stood in front of them, puffing out it's chest in a proud way, sparks jumping from the pouches on it's cheeks. It didn't look too happy to see them. Jamie couldn't help but smile when Trainer's pokemon brought down the flag, bright as a splash of blood against the natural colours of the forest and mountains, and placed it in Trainer's hand. They seemed to really respect her. His smile only increased when they began flying around each other and she understood how they wanted to play a game. It wasn't unlike his connection with Zoroark. He was able to 'understand' her just like Trainer was able to 'understand' her pokemon. Briefly he wondered how many trainers in the world could do that before tilting his head to Zoroark, about to say that they should leave, when a low sound interrupted him. By the time he spun around to see a Frogadier, Trainer's actually, Zoroark had already let out a raspy "Zor!" and cast up a Protect shield in front of Jamie. When the water pulse made impact, the shield dissipated and the Zoroark crouched down, growling as she prepared to attack the Frogadier. However, when Trainer yelled for her pokemon to stop, Jamie quickly pulled on Zoroark's leg to stop her from attacking. As soon as she felt his touch, she pulled back, looking at him in concern and checking him over for any injuries. Only after she was satisfied he was alright did she turn to Trainer and crouch in front of Jamie, eyeing her warily. "Uh-uh, I'm J-Jamie." The boy said uncertainly. Storm. Her name was Storm. After all these months of not knowing, it felt nice to know her actual name. But what would she do to him? Would she make him leave the Forest, like he had seen her do with others? Zoroark was from the Forest. He didn't think that she would want to leave. Would she abandon him if Storm made him go? The Forest was amazing. Every tree and stone in it was unique and different, and when Sen turned around, the trees she had just passed seemed to be different ones entirely. The ground was well worn, but the only tracks visible were pokemons'. Occasionally, a pokemon would run a little ways in front of her. From the ones she had seen, there were all sorts of Pokemon here, not just ones in the Kalos region. "Isn't it amazing, Slayer? Look at all these different pokemon!" "Tal-on!" The pokemon chirped back, watching from her shoulder in awe. As she said it, the hair on the back of her neck stood up suddenly and a bright flash lit up in front of her eyes, blasting the ground and making her stumble back. A Raichu jumped out only a second later, it's fur sparking with electricity as it glared at her. "Uh-oh! Slayer, it's an electric type! Are you going to be able to handle this one?" The pokemon on her shoulder narrowed his eyes at the Raichu before flying off her shoulder and landing on the ground in front of her. "Tal-tal!" Sen smiled. "Alright, let's go! Slayer, quick, use flame charge!" Slayer took to the air, beating his wings to lift off as the ground underneath him began glowing red, spreading to flames that travelled up to the Talonflame's body and enveloping him before he shot towards the Raichu with blinding speed. As soon as Storm had finished speaking, her other Pokemon quickly joined her. Blaziken stood behind her, Noibat landed on her head, the flag still attached to his foot, and Ampharos stood at her side. Once the attention of the child and new Pokemon had been drawn away from Frogadier, he jumped straight up into the branches, disappearing again. Storm smiled at the boy, Jamie, when he answered. "Nice to meet you Jamie!" She tried to sound as nice and cheerful as she could. She wasn't faking it, but she could tell by the way the Zoroark was crouching in front of the boy that it wasn't the most trusting Pokemon. She turned back to look at the clearing before looking back at the boy and his Pokemon again. As much as she wanted to ask him why he was there, she didn't want to scare him more or make him feel like he was being interrogated. Instead, she pointed behind her, "Would you like to join our game? It's always more interesting with more Pokemon or people." Glancing at the Zoroark, she then added, "Or, if you don't want, you're welcome to just watch. I won't run you off or anything." She went back out toward the clearing, Noibat flying off her head and resuming his original position in the air above them. Storm waited a second before backing out of the bushes and joining them, glancing over her shoulder to see if the two would join, watch, or just leave. The Raichu bounced from one foot to the other as the trainer spoke to her Pokemon. Clearly, he was ready for a battle. Sparks continued to jump from his cheeks and his tail lashed back and forth behind him. As soon as the trainer gave a command and the Pokemon took off in flight, Raichu stopped bouncing and braced himself. He watched as the Talonflame charged up it's attack, fire surrounding the bird Pokemon's body before it shot towards him. As Raichu watched, his own body began to spark even more, soon being surrounded with a powerful charge of electricity. Once his body was completely surrounded and charged for a bolt strike, which didn't take too long, he leaped forward to meet the flame charge. The two Pokemon collided with each other, sparks and flames exploding as the attacks mixed and exploded in the air. As soon as the two collided, Raichu grabbed on to the Talonflame, sparks jumping from his cheeks again as he charged up for another electric type attack, this time while holding on to his opponent. 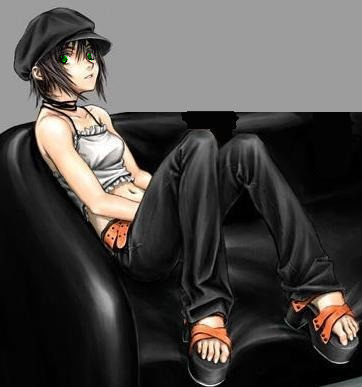 History: Raised in a family that owned nothing but dark pokemon since she was a baby, Luna was greatly effected by the pokemons’ primarily bad auras. As she grew up, her mind became twisted and warped by the auras, leaving her with nothing but the desire to become the ruler over the pokemon. Anyone or any pokemon that tries to stop her is stopped without a second thought. History: His first Pokemon was an Eevee and after it evolved into an umbreon, he decided that he would only try to catch and raise dark type Pokemon. He has a Fearow because it was a gift from a friend to help him be able to travel further. He caught his Croagunk when he encountered it in a forest and decided that he had to have it, for some reason. His Pokemon that aren't dark types still know dark type moves. Description: Brown hair, brown eyes, always wears a nice shirt and tie along with nice pants. History: He was Luna's childhood friend and, because he grew up with her, he witnessed her slowly change from his friend to the person that she is now. He didn't want to leave her because they were friends, so now he works with her. Jamie couldn’t resist staying behind Zoroark’s leg when the other pokemon began swarming towards Storm. Sure he had been in the forest for a while and had been around a lot of pokemon the entire time, it was never as...personal as it felt now. The only other pokemon that had looked at him like that had ended up staying and protecting him. Sure Storm seemed nice enough, but he couldn’t deny that her pokemon were more than intimidating. Zoroark would protect him though. He knew that. “Tal-on!” The fire pokemon screeched as he felt the Raichu jump into his flame attack and grab onto his feathers. With the combined fire and electricity, the Talonflame hadn’t taken much damage, but he could see sparks flying as the Raichu began to charge up another attack from its cheeks. “Oh no. Slayer, quick, fly up in the air! Try to shake it off!” Sen yelled, her eyes widening. An electric attack at that distance could very well make Slayer faint, at the very least paralyzed. He would have to move quickly. She knew he could though. The bird’s body burst into flames as he angled down, folding his wings to his sides and shooting down like a bullet. At the last possible second, he opened them again, turning up from the dive abruptly and corkscrewing again to try and shake the Raichu off before it could unleash its deadly attack. Storm smiled brightly when the boy and his Pokemon decided to join the game. "Basically, the point is to steal the flag from Noibat," when she pointed to her Pokemon, he did a small flip in the air, "and get it to the top of the hill," She pointed to the top of the mountain they had just been training on, which was scarred with the attacks of the session. The mountain was small and seemed like it had plenty of indents that would make it easy for a person to climb. "The Pokemon are allowed to use attacks to either help them reach the flag, stop the Pokemon with the flag, or or stop another Pokemon from taking the flag. But don't worry, they won't use attacks on you are me." Blaziken and Ampharos nodded at her words as they waited patiently for the game to start. "Normally, it would be everyone working on their own, but I understand if Zoroark and you worked together." Once she was done explaining, she stood next to her Pokemon on an invisible starting line, gesturing for the two to join them. "On three. One... Two... Three!" As soon as she said three, her and her Pokemon sprang into action. Noibat shot straight up in the air as Blaziken jumped up, the fire flaring around his wrists. Noibat used a weaker version of razor wind to knock Blaziken back to the ground without actually hurting him. Ampharos ran toward the base of the hill, sparks jumping from her body as she prepared for an electric type attack, though it wasn't clear which one. Storm had simply started climbing the mountain side already, glancing back to see what Jamie and Zoroark were going to do. Raichu held on tight as he could while he charged up his next attack. He did a surprisingly good job of hanging on as the Pokemon flew up into the air. Sparks were still flying from him as he was about ready to attack. However, once Slayer dove down and began a flame charge, Raichu's grip loosened and he ended up losing it completely. He let out a surprise, "Rai!" as he began to fall toward the ground, which was a lot scarier when he wasn't holding on to something with wings. The surprise didn't last long, though, and he managed to unleash a powerful thunderbolt attack toward the Pokemon before he fell the rest of the way to the ground. Nico walked along behind Luna, his hands in his pockets as he watched her talk to her Togekiss. He wasn't a huge fan of fairy types, but he would never tell her that. Even if he didn't like them, they could still beat him in a battle since he was a dragon type trainer. Once the Togekiss was returned and Luna spoke to him, he increased his speed until he was walking next to her. "Well, you know, we haven't been here that long. About..." He looked at his watched quickly, "fifteen minutes actually." He looked around them, adjusting his tie and rolling up the sleeves to his shirt. "If you'd like, we can use Salamence to fly and get a better look at the forest. It'll probably take some time to find Yveltal anyway, I mean, it's not like it's going to be easy." The game seemed easily enough, but already Jamie could see the pokemon attacking each other in his mind. Storm had said it would be gentle, but even still. If he climbed up the rock face, one push could make him break a leg, or worse. When Storm started counting, Jamie began to have doubts. Maybe he shouldn’t do this. Her pokemon were very big, and he was only a kid. He wouldn’t have a chance. He would only hurt himself. With a grunt, Zoroark took off towards the mountain. As soon as she started running, Jamie clamped his legs around her stomach, just in time for her to spring up and embed her claws into the rock, pushing them up towards the flag. Slayer could feel the moment that the Raichu lost its grip and let out a caw of excitement. If it would faint from that height, and even if it didn’t it would be easy prey to hunt. However, even as she slowed and scanned the ground for the electric pokemon, he couldn’t see anything. “Slayer, look out!” He heard Sen scream. The Talonflame was, for once, too slow. Before he could react, electricity engulfed him, pulsing through his body. He shrieked and dropped to the ground, the fall only stopping when he landed on a mound of warm, dark fur. Skull greeted him with a growl before Sen got there. “Slayer, Slayer, are you alright?” She shoved the strands of her green hair that fell into her eyes. The bird pokemon hadn’t fainted, but he was weak. He cawed and flipped onto his stomach, pushing himself to his feet. If the Raichu was still awake, he would keep fighting. After Blaziken had fallen back to the ground, landing on his feet without difficulty, he tensed up for another jump. He didn't get the chance jump again, though. Ampharos had used Noibat' distraction as an opportunity to to let off a thunderwave attack, which was aimed straight at Noibat. Noibat didn't have much time to react, but he did manage to dive down and avoid the attack, which harmlessly shot past Noibat before disappearing in the air. Because he had been to busy trying to avoid Blaziken and Ampharos, he hadn't even seen Zoroark and Jamie jumping toward him. Zoroark's claws gripped the flag, pulling Noibat down from the air. He tried to fly away, but the flag came loose and slipped from around his foot. He flew back up in the air after he had lost possession of it and instead began watching the rest of the game play out. Storm was the furthest ahead on the mountain and she had stopped on a ledge to watch and wait for the flag to come to her. Ampharos, not being the best climber, had started to make her way up the mountain side as well, keeping an eye on Zoroark and waiting for the right time to strike. Blaziken, however, saw who had possession of the flag and immediately changed direction. Instead of aiming his leaps toward Noibat, he instead began pursuit of Zoroark and the boy. He leaped to where they were, his claws outstretched to take the flag, though he was careful to not actually scratch the Pokemon or the boy. After Raichu had unleashed his Thunderbolt attack, he had fallen the rest of the way to the ground. Not having any way to break his fall, the impact was rather hard. He laid on the ground for a moment, listening as the trainer called to her Pokemon. Once he saw that the bird Pokemon had landed, he pushed himself up to a standing position. When he was on his feet, he was swaying slightly and it was clear that he had been burned by the multiple flame charge attacks. That didn't stop him from standing and facing the Pokemon and trainer again. Small sparks of electricity were jumping from the Raichu's cheeks as he stood watching Slayer, waiting for the next move. It was clear that he was willing to keep battling, though he didn't look to be in the best condition for continuing. Nico listened as Luna began talking about her plans on which Pokemon to find first and how they were help her in her conquest to control others. He had to suppress a sigh, wishing he could somehow make her see that she didn't need to control others. He knew it would be a futile argument, though. Instead, he tried to keep up with her shifting topics and mood in order to make the right reply. Once he was sure she was done talking, he gave a thoughtful answer. "Well, we have heard more stories of Yveltal being in this forest than we have Xerneas. It might be wiser to look for Yveltal first and then focus on Xerneas. I don't think we need to burn the forest down, though..."
He looked around again, finding it strange that there weren't any Pokemon when they had heard stories of countless Pokemon living here. "It is also said that Xerneas has the power to create forests and since this one is so... Different, there is a chance this is one of those creations. That could also mean that Xerneas isn't here anymore." As he finished talking, or thinking out loud, he stopped walking and grabbed a pokeball, releasing his Salamence, who let out a happy roar at being let out. Salamence lowered his head to Nico, who gladly petted him. "Salamence isn't a bad Pokemon, you know. He's carried you plenty of times. " Nico walked to Salemence's side and, in response, the large dragon Pokemon laid down on the ground, allowing Nico and Luna to climb onto his back.